Summary: Difference Between Pinocytosis and Receptor-Mediated Endocytosis is that Pinocytosis (“cell drinking,” from Gr. pinein, to drink  cyto, cell) is nonspecific uptake of small droplets of extracellular fluid. While Receptor-mediated endocytosis involves a specific receptor protein on the plasma membrane that “recognizes” an extracellular molecule and binds with it. Pinocytosis (“cell drinking,” from Gr. pinein, to drink  cyto, cell) is nonspecific uptake of small droplets of extracellular fluid. Any small solid dissolved in the fluid is also taken into the cell. Pinocytosis occurs when a small portion of the plasma membrane indents (invaginates). The open end of the invagination seals itself off, forming a small vesicle. This tiny vesicle detaches from the plasma membrane and moves into the cytoplasm. 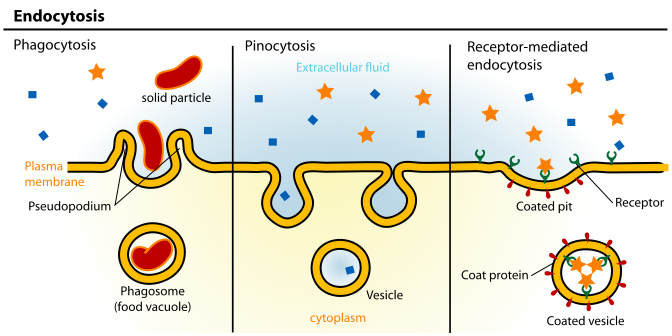 Receptor-mediated endocytosis involves a specific receptor protein on the plasma membrane that “recognizes” an extracellular molecule and binds with it. This reaction somehow stimulates the membrane to indent and create a vesicle containing the selected molecule. A variety of important molecules (such as cholesterol) are brought into cells in this manner.